Stock photo of the Parador de San Francisco (hotel), formerly the Monastery of St. Francis, The Alhambra (La Alhambra) - designated a UNESCO World Heritage Site, City of Granada, Province of Granada, Andalusia (Andalucia), Spain, Europe. The opening in the hedge shows an interesting view of the Parador de San Francisco. 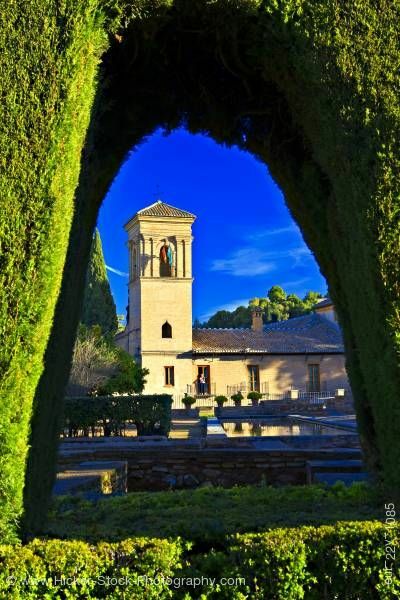 This stock photo shows the Parador de San Francisco (hotel) through the opening of the tall hedge, formerly the Monastery of St. Francis, The Alhambra (La Alhambra) - designated a UNESCO World Heritage Site, City of Granada, Province of Granada, Andalusia (Andalucia), Spain, Europe. Looking through a large hedge archway is a view of the Parador de San Francisco. Originally the Monastery of St. Francis, it is now a hotel. The archway view shows a stone walkway with a row of hedges and a pool. The backdrop is the hotel with its square bell tower on the corner of the building. The hotel has long windows that open to its own small balcony. The bell tower has an archway in the center with two columns on each side. Parador de San Francisco (hotel), formerly the Monastery of St. Francis, The Alhambra (La Alhambra) - designated a UNESCO World Heritage Site, City of Granada, Province of Granada, Andalusia (Andalucia), Spain, Europe.